I have a lot to talk about Ginza district, which is known as one of the biggest shopping districts in the world, but I’d like to share 2 things to begin with. Both are my favorites and I definitely recommend them! It’s the Official Shop of Okinawa, the southern tropical islands of Japan! Did you know that Okinawa was an independent kingdom? That’s why they have unique, fascinating culture and foods. Starting from the Okinawan entrance, the inside is all Okinawa. This shop is very popular among those who work in Ginza, Tokyo locals and tourists. You’ll see Okinawan fresh fruits, drinks, snacks, seasoning, sake, arts, clothing, musical instruments, CDs, books, massage oil, etc. Everything you see in the shop are DIFFERENT from any other Japanese souvenirs, so you can feel cultural diversity. And the fine atmosphere makes us so happy! 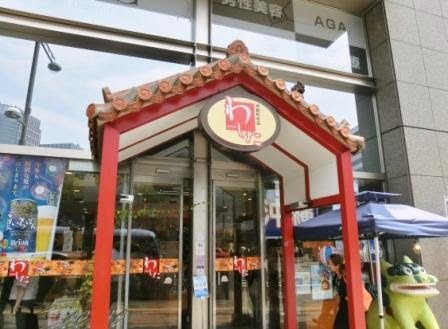 Moreover, there is a small Okinawan restaurant. Okinawan Noodle. Sooooo Good!! 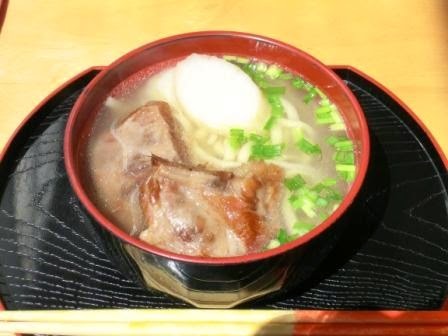 You can try most Okinawan foods here. Don’t miss the chance to explore Okinawa! 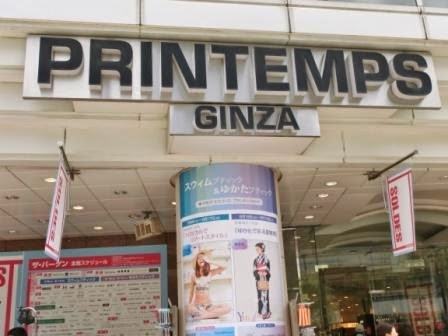 Along the same main street, there is Printemps, a famous shopping mall in Ginza. Printemps means “Spring” in French. Famous Angelina cafe and restaurant is in the 2nd floor. The lunch costs just from 1,300 yen to 1,600 yen (1US$ = around 100 yen) and you can add its mont-branc cake with 378 yen. I have entered the restaurant 3 times or more, and every time they served Amazing dishes. 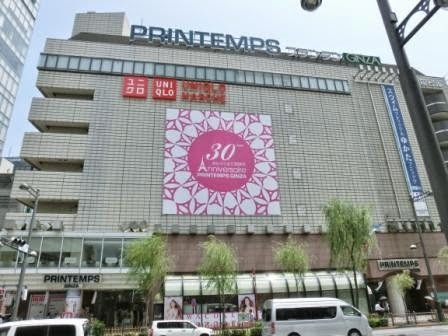 Mostly Printemps is a shopping mall for cloths and make-ups. Office, casual and formal closing are cool. Can you see models in yukata (summer kimono) and swimming gear in this photo? It’s summer, so they hold Yukata Fair and Swimming Gear Fair. If you want a kimono (a genuine one, not a souvenir kimono,) it’s a great opportunity to get one. As far as I saw it, the Yukatas cost 10,000 yen to 20,000 yen, (and you need some other items to put on,) which are relatively high as a yukata, but their designs and patterns were really cool and truly Japanese. You won’t regret if you buy a yukata here. Printemps often holds a seasonal fair, like Dress Fair in winter for graduation ceremonies in March, so you’ll enjoy it in any season. Ginza is known as a district of luxury brand shops and department stores. But I cannot pass in front of these 2 Must-Sees in Ginza. Even if your interests are those brand shops, have a look at them. Your trip to Ginza will be more colorful and exciting!